Donations can be made via direct mail or PayPal. If mailing your donation, please click here to print the Donation Form. Be sure to include your mailing address as it is important to us that all contributors be recognized by the K9s of the War on Terror. K9s of the War on Terror. 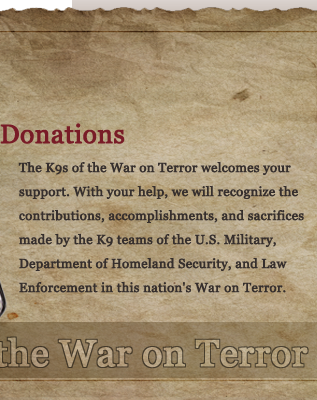 Is K9s of the War on Terror [K9WT] a reputable charity? The K9s of the War on Terror is a Massachusetts corporation an dis a 501(c)(3) Public Charity as defined under Section 170 of the IRS Code.. Click here for our IRS determination letter. Our Federal ID number is 27-3461813. Contributions to the K9WT are deductable under Section 170 of the IRS Code. The K9WT is also qualified to receive tax deductable bequests, devices, transfers or gifts under Section 2055, 2106 or 2522 of the IRS Code. 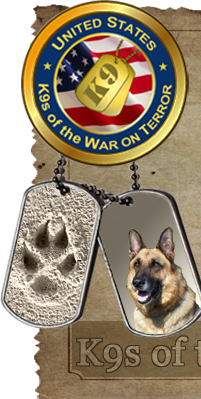 What is K9s of the War on Terror’s Mission? The mission of the K9WT is, “To recognize the contributions, accomplishments and sacrifices made by the K9 teams of the U.S. Military, Department of Homeland Security and law enforcement in this nation’s War on Terror”. Since September 11, 2001all sectors of this country have been engaged in the War on Terror with little or no recognition for the K9s teams who carry out the day to day tasks in keeping the country safe. The K9WT intends to rectify this by erecting both a monument to these teams as well as presenting the K9 Medal for Exceptional Service to deserving K9 teams. This medal represents the first of its kind to be awarded to animals in the War on Terror. At present the United States is the only major country that does not recognize its war animals with a medal. The availability of this medal is both timely and long overdue for not only military working dog teams, but those of the Department of Homeland Security and the numerous enforcement agencies involved. How does K9s of the War on Terror accomplish its goals? The funding necessary to support the erection of a monument and to maintain the Medals Program will be obtained from both corporate as well as private sources through tax deductable donations. In addition the K9WT maintains an active web store that provides a variety of merchandise specific to the K9WT. How is the K9WT managed? The K9WT is managed by a six man Board of Directors who voluntarily provide their time and expertise in support of the project. None of the board members receives a salary or stipend of any kind and none of the board members profits in any way from the activities of the corporation. A Medals Review Committee composed of three individuals with experience in law enforcement, military history and a retired member of the U.S. military along with the President of the corporation receive, vet and review all applications submitted for the awarding of the medal. Donations can be made online via paypal or via direct mail. Please print out and complete the donation form and mail it in along with your donation to K9s of the War on Terror, Inc., P.O. Box 3436, Waquoit, MA 02536-3436. 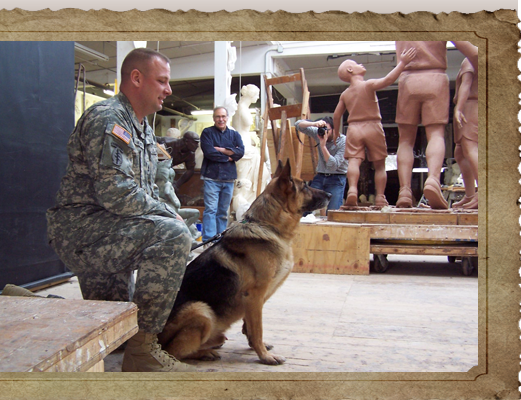 Donations to the K9WT are used exclusively to support the construction and erection of the monument and for the ongoing support of the Medals Project. A small percentage of all donations is utilized to support the operation of the corporation.